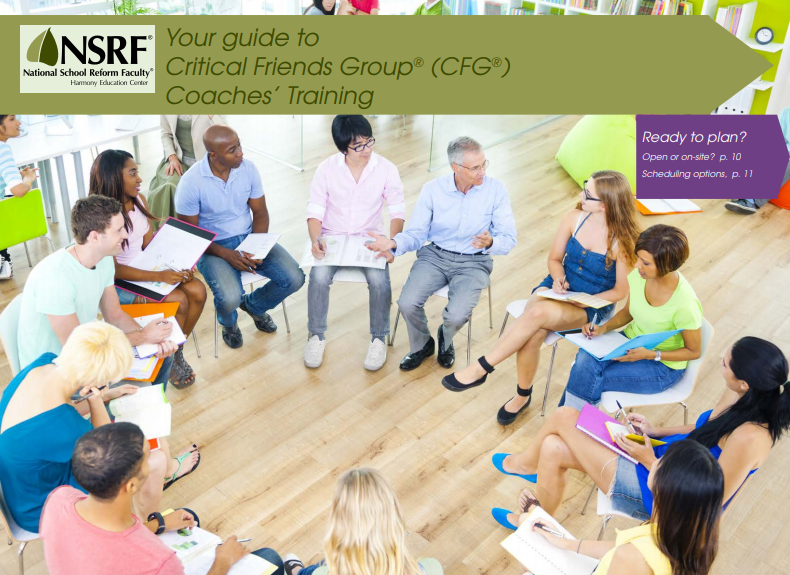 For additional information, please download and read our Guide to Critical Friends Group® Coaches’ Training for more information in a more easily shared format. How do I become a fully trained CFG coach? In order to purchase a Coaches Membership on our site, purchase a Coaches Handbook, and view ALL of NSRF’s protocols through the Protocol Matching Tool, you are required to be a fully trained Critical Friends Group Coach having attended FIVE FULL DAYS of open or on-site training arranged by NSRF with a certified NSRF National Facilitator. Upon completion of this training, we provide you with a certificate of completion via email as well as complimentary “Trained Coaches Status” on our website. Trained Coaches Status allows you to renew your coaches membership each year and to re-purchase your Coaches Handbook. If you attended a training but were unable to attend all FIVE days, you will not be given this official coaches status unless you successfully made arrangements to complete “homework” assigned by your National Facilitator to make up for the time you missed. Your National Facilitator will need to let us know this work was received so that we might update your profile and membership accordingly. If you received full CFG training but you do not see “Trained Coaches Status” listed under “Memberships” on your account profile Dashboard, contact our office directly. I found a broken link on your new website. What should I do? We are in an ongoing process of making adjustments and improvements for you on the new site to make things even better. If you should discover a link on a site page or within one of the protocol PDF files that seems “broken” or brings you to a 404 page or a page not “found,” please let us know right away so we can fix it! You can send us an email nsrf@nsrfharmony.org or send us a quick note through the Contact Us form. Also, if you were hoping to utilize a certain protocol when you discovered the broken link, you can likely find this protocol through the name search on our Protocol A-Z list. Thank you for your help with this! Our shipping and handling on our site’s store is set-up for purchases shipping to the United States and our neighboring countries, Canada and Mexico. It is not set up to best serve all international purchases, however, we CAN certainly send you something wherever you are in the world! You can make a purchase through our store wherever you may be, but please know the final cost of hipping and handling may vary. We prefer to ship Priority International. We will notify you right away, prior to shipping, for any additional charges if the changes are significantly different from the final price you paid through the website. If any change to the final cost effects your decision to purchase our products, we can provide a full refund for you easily. Unless orders are large, this is rarely an issue calling for follow-up or significant changes. Is security and my privacy considered regarding my profile and account on your site? As a trainer of educators around the world, we do maintain a secure and private database of user profiles with basic billing and shipping information, as well as school or organization information and past CFG Coaches training information, but the detail of your billing and shipping information connected to your account profile is entirely up to you. You can edit, expand, or remove your profile information in your “Dashboard” which you can find through the link “My Account/Log-in” accessible through the site’s top main menu. Your profile information is never sold or exchanged in any way for any reason. As a regular member or visitor/customer to the site who has only created a quick log-in, you will not receive any emails from our office unless 1) you have completed an official NSRF training or 2) you have requested to subscribe to our quarterly newsletter Connections. If you should purchase a product, membership, or registration through the site, the site and PayPal will email you notifications/verification regarding these purchases. We can delete your online user profile any time upon your request; however, once your profile is deleted, you will need to recreate your log-in and profile if you wish to regain access to the site. If you have completed coaches or admin training with us, we do keep this information in our private offline files for future reference. We do NOT save your credit card information; instead, actual payment for our store products will take you through PayPal to complete the purchase. Please know this does not require you to create an official PayPal account. You can make a purchase in PayPal as a guest by choosing the option to “Pay with Debit or Credit Card” instead of “logging in” to PayPal. You can also make purchases by calling the office directly. Do I need to have a PayPal account to make a purchase from NSRF’s store? Although we do keep your profile information, we choose not to keep private credit card information on file, so we allow purchases to be made quickly through PayPal. When you are completing purchases, the “check out” button will take you to our PayPal site page to complete your purchase. We have found this method to be stable, secure, and functional. You are NOT required to have a PayPal account to make a purchase in this way, and, once you have been taken to the PayPal site to complete your purchase, you can make your purchase as a “guest” by clicking on the gray button which reads “Pay with Debit or Credit Card” instead of using the username/password option to sign in to PayPal or instead of choosing to create a new PayPal account. If you’re uncomfortable with sharing your billing, shipping, or credit card information online, please call us at 812-330-2702! You can make any purchases by phone through our small private office, and we will fully destroy your credit card information after the payment has been ran through NSRF/Harmony Education Center’s own payment process. How can I see ALL of the protocols? We have several protocols available to the public which only require a quick log-in with a username and password. We have additional protocols available exclusively for regular members who have paid $25 for an annual membership. Viewing ALL of our protocols, including our most up-dated protocols used in CFG trainings, is exclusive to certified Critical Friends Group coaches who have completed the full five days of training and who have a current paid Coaches Membership. If you might be interested in completing one of our trainings, read more on the pages offered through the “Trainings” link on the sites’ top main menu. Can I order a CFG Coaches’ Handbook? The Critical Friends Group® Coaches’ Handbook is a publication exclusive to fully trained coaches who have completed a five-day developmental CFG Coaches’ training event. Upon completing one of these trainings, you can become an officially certified Critical Friends Group Coach which earns you the know-how of using NSRF’s effective protocols in groups, meetings, and classrooms. When attending the training, you are given a Coaches Membership for a full year as well as your own copy of the Critical Friends Group Coaches’ Handbook, and, if you should need to replace your handbook in the future, you are given “Trained Coaches Status” on our new site which grants you access to purchase this handbook in our store. Unless you have Trained Coaches Status, you will not see the Coaches’ Handbook in the store. Why do I have an NSRF account? Your account on the NSRF site allows you to have a “Dashboard” available to you through the link “My Account/Log-in” on the site’s top main menu. Your Dashboard is an excellent tool through which you can manage your resources and information. You can edit, expand, or remove your profile information in your Dashboard. You can also 1) view your past orders from our store, 2) manage your current memberships, 3) view and download virtual products you have purchased, and 4) change your profile name, email, and password. Your account also holds the information connected to your paid membership. We hope you find this useful! If you have any questions or problems with the Dashboard, feel free to give us a call or send us a note via email or through the Contact Us form. Reset or change your password on the login page by clicking the “Lost your password?” link. This will generate an email to the address we have associated with that username. If you don’t see this email in your inbox right away, check your Spam folder. If you don’t receive this email with a link through which to reset your password, send us a direct email or call the office, and, if you connect with us during office hours, we can send you a temporary password right away to get you logged in. Once you are logged in to the site, you can change your password by going to your Dashboard through the “My Account/ Log in” link available to you on the site’s top main menu. On your Dashboard, you can see the option to “edit your password and account details” link there, or you can change your password under the “Account Details” tab. Do I need to register to log in? What if my old username or email isn’t working? You shouldn’t have to register again on our new site if you had an account or membership on our old site. If you’re having problems with your log-in information, double-check the spelling of your username and/or password. If you’re confident about your username, try the “Lost your password?” link (under the sign-in box) on the login page. If you don’t see an instructional email to reset your password right away, try checking your Spam folder. Finally, if you’re not confident about your old username or the email address attached to your old account, we can look this up for you and would be happy to help! We can even send you a temporary password you can change once you’re logged in. Contact us via email nsrf@nsrfharmony.org or use the Contact Us form or call our office at 812-330-2702. If you have completed a CFG Coaches’ training with us, you should certainly have a profile on our site. It’s likely your username is the permanent email address you provided for us then. If you haven’t visited NSRF’s website for several years, you may need to re-register and create a new username and profile, especially if your email address and contact information has changed. Why do I need to “log in” and create a username/password? We ask that you “log in” with your own username/password to purchase from the store, register for a training, or access the protocol searching tools. Our site has specific pages and products exclusive for paid members, trained Critical Friends Group coaches, and materials for our national facilitators. Essentially, your quick log-in identifies your membership. This username may be connected to a more complete personal profile, but it doesn’t have to be. We keep whatever profile information you would like us to keep, and you can edit and expand your profile information in your “Dashboard” which you can find through the link “My Account/Log-in” which is accessible through our site’s top main menu. You can reset your password on the site at the log-in portal or here. What are your refund policies for trainings? NSRF works hard to keep the costs of five-day trainings low, and only accepts up to 15 participants per national facilitator, which makes it an especially high-value training opportunity. Because of the limited number of seats and the low margin, full refunds are only available with cancellations eight weeks before the event. If you must cancel between six and eight weeks, you may receive a 50% refund. Later than six weeks, we cannot offer a refund. We encourage anyone whose plans have changed to transfer their paid application to another attendee, if possible. If you must cancel your attendance and/or transfer your registration fee to another person, please give us a call at 812-330-2702 for further instructions. Please note, by submitting your registration to a training you are agreeing to these terms. What are your refund policies for purchased materials? Unused and unopened books and materials in brand-new condition may be returned for a complete refund, less the shipping charges and a 5% restocking fee. DVDs and CDs cannot be returned. How can I become an NSRF® National Facilitator? Complete our five-day CFG® New Coaches Training. Maintain a paid coach’s membership in NSRF. Download and utilize the updated [M] and [C] member-only materials in your work, particularly when these newer versions replace [O] versions. Lead a CFG community for at least a year (minimum of 16 hours, usually eight 2-hour meetings). Submit agendas and reflections of that year’s meetings to the NSRF (email documents to or share files with nsrf@nsrfharmony.org). We will review those documents and, if you’re ready, match you with a mentor National Facilitator. Assist multiple mentor National Facilitators in leading a minimum of three five-day trainings. Submit your reflections on those internships to NSRF and your mentor(s). When the mentor believes you’re ready, they submit a letter of recommendation to the NSRF office for you. Sign non-compete forms and instructions on conducting open trainings. Pay your National Facilitator annual fees. I facilitate meetings and trainings for others. Will you hire me? Only if you fulfill all the requirements every other NSRF® National Facilitator has completed (see below). What can and can’t I do as a coach? Anyone is welcome to use NSRF® protocols and activities in your classroom, in your personal work, and even off the job in your PTO committee or church group, for example. As an NSRF-certified CFG coach, you may create and lead one or more Critical Friends Group® communities. You may also adapt existing protocols to better fit your needs (although we recommend you first work with the existing protocols awhile before leaping to make modifications). And you’re expected, within your working CFG meeting, to transparently facilitate protocols so that others within your group can alternate leading those protocols. That’s the best way for a peer CFG coach to be able to bring your own work to the table, if someone else can facilitate that protocol that day. The one thing you are not yet certified to do is to attempt to train others to become CFG Coaches or suggest they create their own CFG communities. The only people certified to train CFG coaches are NSRF National Facilitators. Our National Facilitators have all gone through a process that takes more than a year to ensure they have the knowledge and skills to train coaches appropriately. If you are “taught” to be a CFG coach by someone who has not fulfilled those requirements and is not certified as an NSRF National Facilitator, we cannot guarantee your capabilities as a coach, nor certify you as one, nor acknowledge your credentials to allow you coach membership access on this website. If we didn’t train you, we don’t know what you did or didn’t learn. Would you accept the license of a driver who said he was trained in a country you’d never heard of? Can administrators coach teachers at their school? CFG work is based in having a trusting environment that supports individual growth and improvement. If your supervisor is leading your CFG meeting, you’re not terribly likely to bring your most challenging dilemmas or work to the group, right? Even if an administrator who leads a specific CFG community is not your direct supervisor, that administrator, at best, will have divided loyalties and may not be able to keep your work confidential. We strongly encourage CFG communities to be coached by peers, for the best effect. Administrators can get great benefits from having their own CFG communities, with peer administrators from their school or district, or even from schools in other cities, as well. Can you come to my school/district/city? Certainly! If you have ten to 15 people to be trained, it will likely be more cost-effective for us to send you an NSRF National Facilitator than for you to send all those people to one of our Open Training locations. If you don’t have quite that many people ready to be trained within your school, but you have at least six or eight people to be trained (depending on your budget), we can work with you to “open up” your training to others within your geographic region to get you up to 10 or 15 people, enough for a full training. “Opening” an on-site training will require your school guaranteeing the full cost of the training no matter how few people participate, and then, with our support, marketing those open spots to fill the cohort. Typically, we set a deadline together to ensure that enough participants sign up so your cost per person isn’t prohibitive. It’s best for us to have a conversation about this rather than try to explain it in a FAQ, so please call us at 812-330-2702. Open trainings are usually $815 or $825 for five days, depending on the location, plus your travel, lodging, and some meals. All materials used in the training are covered in that fee, including a Critical Friends Group Coaches’ Handbook and a year’s NSRF membership at the coach level for those who complete the training. If you have enough people to be trained that it’s more cost-effective for us to come to you to conduct an on-site training, the cost-per-person is about $750-1,000 per person, depending upon the number of trainees and your geographic location. Most of our costs in an on-site training are fixed (transportation, lodging, etc. ), and the “sweet spot” in terms of keeping the lowest cost-per-person is booking a training for 10-15 people. If you’re interested in a three-day administrative training, those are generally conducted on-site and the price varies by your needs. Please see the on-site training portion of our website for many more details, and then contact us with your questions or specifications for your event. If you wish to be considered for subsidized training either as an individual attending an open training or a school needing on-site training, please contact us by email or phone (812-330-2702). Can administrators be trained at the same time as teachers? We encourage every school practicing CFG work to also invest in training at least a few administrators. Only through experience can anyone really understand the deep and lasting value of this work. But it’s challenging in an on-site training — not to mention an ongoing CFG community — for administrators to sit around the same table with their teachers when it’s time to do the work: will every teacher in the group feel safe enough to bring their deepest dilemmas and hardest challenges sitting next to their supervisor (or someone who may report to their supervisor)? Usually not. Power differentials make it extremely difficult to feel trusting. Conversely, administrators probably can’t bring some of their dilemmas and work problems to a roomful of teachers. If you’re not using CFG communities to address your school’s unspoken, deepest needs, then you’re only skimming the surface of what NSRF protocols and CFG work can do for you. So we encourage, whenever possible, that administrators have their own CFG communities, and neither lead nor participate in their teachers’ CFG meetings. For training, we suggest that admins attend our Open Trainings (where they’ll interact with a wide variety of educators in and out of the classroom — just not THEIR classrooms). If you want admins trained on-site, it’s best to find 10-15 admins within your school or district, or else, with our support, “open up” an on-site administrative training to others in your geographic area. Many NSRF protocols are beautifully supportive of administrative dilemmas and work tasks. So, just like anyone else in training, administrators will bring home actionable insights on their own dilemmas and work. And because administrators don’t always want or need to coach a CFG group, we developed a three-day administrative training track tuned specifically to administrator’s needs (more on strategic planning, for instance, and nothing on student work). Administrators who take the shorter training will not be certified to lead CFG communities, but they may use the protocols in their own meetings and private work. Do I really need to bring my own dilemmas and work to training? Yes. Before a training, it’s hard to believe that strangers can help you significantly. But we debrief after every protocol, and presenters consistently express gratitude and astonishment at the insights they gained from the group. NSRF protocols, used within a trusted CFG community or training cohort, allow everyone to contribute to every dilemma or piece of work. Even individuals who don’t work in your environment or teach the same classes as you, or come from [private/public, rural/urban, whatever opposite situation you can think of] have insights into your work. Actually, the most effective CFG meetings (like our open trainings) are the most diverse, bringing fresher experience and new perspectives to dilemmas and pieces of work that you and your colleagues have struggled with, maybe for years. How large are the training groups? For the five-day new coaches or experienced coaches trainings, we aim to hold to a 1:15 facilitator-to-participants ratio so that every participant gets a uniformly satisfying experience. One major benefit to NSRF trainings is that every participant brings a dilemma and a piece of work to the trainings, and we work on those things together during our week of training. Did you catch that? Through the course, we actually conduct and practice protocols on your work. We don’t waste your time with “theoretical” or “generic” problems. You’ll use NSRF protocols to bring home valuable, actionable next steps on your own issues. And before the week is out, you will individually lead at least one protocol in a smaller group. Again, keeping a 1:15 ratio of facilitators to participants allows you this personal attention. One-day intensives can vary in size, depending on the content desired, the number of CFG coaches you already have at your school, etc. Besides the 5-day training, how can you help us? Schools with active CFG communities, with administrators who understand the great value of protocols, sometimes hire NSRF National Facilitators to lead high-stakes meetings or to conduct very specific, targeted workshops. When called in for meeting facilitation, NSRF Facilitators can be counted on as a neutral third party without a stake in the outcome. Our job is first, to prep for the meeting by understanding the outcomes you’re seeking with the event; second, to design a program to meet those needs: and last, to facilitate an agenda of protocols and activities to achieve your goals and deliver actionable next steps. Complex discussions around strategic planning, major dilemmas, and multi-step projects have all been facilitated successfully by members of our team. Also, if your school is interested specifically in learning observation or Looking At Student Work protocols, or needs support with equity issues, we can also lead one-day intensive trainings. These are most successful if participants have already been certified as NSRF CFG coaches, but it’s not absolutely required that everyone in the room has previously had our training. We also offer a small, select catalog of materials that we’ve found to be helpful in doing CFG work. What can you teach us in a day, or half a day? In a day, you can get an introduction to CFG work: you’ll learn a few activities and just one or two low-risk protocols. That will give you a flavor of how protocols work, and a bit about what Critical Friends Group® work can do. But in one day, you definitely will not be sufficiently prepared to create and conduct CFG communities on your own, or to effectively use our large library of protocols. Hiring us for a half-day CFG event, honestly, would probably raise more questions for you than answers: we can tell you about protocols and CFG work, answer some basic questions, offer a solid presentation about the importance of equity or listening skills or feedback (for instance). But if you need more than ideas, you’ll need to be with us for well more than half a day. Do we have to take five consecutive days, or can the training be split up? During the summer months, we tend to conduct trainings on consecutive days to reduce travel costs and keep momentum going. But during the academic year, we typically split up the training so you don’t lose five consecutive days in your classroom or office. Generally, we’ll work with you for three days, then return a few weeks later for the last two. Why do the trainings take 5 days? How often have you attended an invigorating PD event and come home, thrilled to use your new knowledge, only to realize, “Okay, HOW EXACTLY do I accomplish these lofty goals?” And how often have you attended a shorter training and then wanted more practice, more guidance, and more support in bringing the tools home to colleagues or students who’ve never seen those ideas? NSRF® New Coaches Trainings are designed to avoid these letdowns, and more. get practical support to encourage and develop CFG communities throughout your school. Five days? It’s action-packed. This is NOT a “sit-and-get” event. Anything less than five days’ of training is insufficient for you to actually put these NSRF Protocols to work for yourself, your colleagues, and your students. You’ll see. Or we can give you references, if you’d rather have someone else’s word for it. What’s the value in becoming a member of the NSRF® organization? First and most important, NSRF® paid memberships allow us to maintain and improve our work, long-term, so our protocols and activities can continue helping learners of all ages achieve greater successes worldwide. Membership funds also support our ability to offer scholarships for those who need it. (You may also donate specifically to our scholarship fund.) With the purchase of a paid annual membership for $25, you are given access to an extended number of protocols as well as our Protocol Matching Tool. In renewing your trained CFG coaches’ membership annually for $75, you maintain your access to ALL of our protocols and protocol searching tools as well as additional coaches’ resources and support. The National School Reform Faculty® began as a totally grant-funded organization. For several years now, we have operated solely on income from our trainings, materials sales, and memberships. When we started offering paid memberships, a decision was made to offer varied levels of fees without any variation in benefits, but we developed this website, new materials, and a tiered membership model to help NSRF be more sustainable into the future and to keep our training costs as low as possible. We hope the increase in benefits inspires you to continue supporting us, as we strive to continue supporting you more and more effectively. Can I use your protocols in my book/class/workshop/etc.? All NSRF protocols and activities may be used freely in the context of a CFG community or a classroom as long as the attribution to the NSRF organization and the individual authors remains intact. If you’d like to use our materials within a book, workshop, online event, or otherwise, please contact us by emailing us or phone (812-330-2702) to work out the details. Why take the training when the protocols are here for free? Successfully conducting NSRF® Protocols is rather like cooking for a dinner party of important guests: we all know fabulous cooks and not-so-fabulous cooks, and many of us know the pressure of hosting high-stakes dinner parties. So imagine NSRF protocols as recipes for fine French cuisine, written by a broad variety of chefs. Then ask yourself if you’ll have a more satisfying meal if you attempt the recipes on your own, or if you’ve first experienced the recipes with the careful guidance of a French cooking school. Yes, you might end up with “edible food” if you haven’t been trained, but you probably don’t have all the skills to ensure you the most satisfying “meal,” or desired result. To be frank, we have heard of many fine people attempting to use our materials without NSRF training, resulting in “protocol disasters“ far worse than a fallen soufflé. A poorly facilitated protocol may fail to deliver the outcome you desire, may leave your colleagues feeling worse about their dilemma or piece of work, and worst of all, may leave all the participants with “a bad taste in their mouths” so they never want to use protocols ever again! So, yes, we highly encourage you to complete CFG coaches training. Also, the protocols freely available on this website (if you haven’t logged in as a paid member or member coach) are the original protocols developed in the early years of the NSRF organization back in the mid-1990s. If you take our NSRF New Coaches Training or Experienced Coaches’ Training, you’ll have access to protocols and activities designed to be more readily understood by “new cooks.” We’re always trying to help you avoid “protocol disasters” and be as successful as possible. What are protocols and why should I use them? “Protocol” is our shorthand term for structured processes and guidelines that promote meaningful and efficient communication, problem solving, and learning. Contrast this idea with meetings and conversations where the content may wander, a few voices may dominate while some are never heard, and lots of “talk” but very little “action” happens. Like guardrails along a highway, NSRF protocols, under the leadership of a trained coach, provide guidance and safety, and help ensure your arrival at the proposed destination rather than being pulled off-track. look at student work with specific objectives and needs in mind. Do I have to be trained as a CFG coach to participate in a CFG meeting? No, you don’t. Every CFG® community should be led by an NSRF-certified CFG coach, but anyone can participate. On the other hand, a CFG community that has multiple trained coaches participating can improve everyone’s outcomes. Having more people who understand the reasons for and expected outcomes of each step means that the group’s work as a whole will be stronger and more efficient. “Critical Friends Group” is trademarked? I never knew. When you sign up to become an NSRF-certified CFG coach, you will complete five full days of training with us. You’ll experience the protocols as led by an NSRF National Facilitator with a known track record of facilitation expertise and finesse. You’ll experience the protocols as they were designed to be experienced, not in a haphazard way, and then you learn what’s behind that facilitation: the subtleties that aren’t written in the instructions. You’ll learn an important series of protocols and activities to build trust within the CFG communities that you will create and sustain, and learn when and how to revisit those activities for best results. You’ll leave the training knowing the most effective techniques to give and receive feedback to avoid negative outcomes when doing critical, often emotionally-charged work within the CFG meetings. You’ll learn how to select and use protocols to provide balanced participation among all participants in a meeting — not just the ones accustomed to speaking. And you’ll get a toolkit not only for how to run meetings once your CFG community is established, but how to get the work established in the first place. NSRF National Facilitators are well-trained professionals. They are required to complete the initial five-day coaches training themselves, and spend more than a year honing their practice, interning, and meeting standards. Once they’ve been certified, they continue to work with the NSRF organization to ensure that the trainings they perform meet our standards. All so that when you see “Critical Friends Group,” you can trust what you’re getting. Can I call my group something different? You can call your groups anything you like and use our protocols and activities within them to great advantage. We suggest that you carefully avoid a name that feels like “jargon.” Some names seem to push people into an “us vs. them” situation, where “we” who know what the jargon means can inadvertently create separation from “them” who do not, which is exactly the opposite to the purposes of Critical Friends. The name isn’t the magic, and frankly, the protocols in themselves aren’t, either. The combination of using our activities and protocols to build trust, making and honoring agreements, then using our materials regularly to efficiently and effectively deal with dilemmas and work issues … that’s where a small group of educators can have the most powerful effect. And if you’re in an environment where a number of CFG communities (or whatever you call them) work together towards common goals of student achievement, then “magic” happens regularly throughout your organization. All that said, if you’re using our materials, you’ll need to keep our attribution, the NSRF® name and contact information on them. Although the original NSRF materials were developed using grant funding designed to keep them open and available to anyone, the newer materials are copyrighted, and we do take that copyright seriously. You’re welcome to copy and use our protocols and activities within your meetings or classrooms, but for uses beyond those, please contact us by email or phone (812-330-2702) with your questions or requests. What’s the difference between “protocols” and “Critical Friends Group®” meetings? A protocol is a structured process or set of guidelines to promote meaningful and efficient communication, problem-solving and learning. Protocols give time for active listening and reflection so all voices in the room are heard and honored. The NSRF website includes a comprehensive list of protocols to be used for a wide variety of purposes. In contrast, a Critical Friends Group community is a particular variety of Professional Learning Community (PLC) so unique that we’ve registered it as a trademark. CFG communities consist of 5-12 members who commit to improving their practice through collaborative learning and structured interactions (protocols), who meet at least once a month for about two hours. Critical Friends Group coaches create an environment of trust that allows participants to give and receive feedback most effectively, and to use our protocols and activities to help students — and teachers — create a culture of excellence. For a more complete explanation, please read this article in Connections. Why CRITICAL? What’s with the name? Think of the “critical” part of Critical Friends in the same vein as “critical care units” in the hospital: the circumstances dealt with in CFG® meetings are incredibly important, essential to the health of your school, oftentimes urgent, and sometimes work-life-threatening. Working together with a group of true friends (not just “congenial colleagues“) who help you continuously improve your practice, celebrate successes together, and actually help solve your day-to-day problems … what could be more critically important than that? CFG® interactions are never about criticizing, but about friendly, professional support that results in true collaboration and collegiality. We teach you specific techniques to share thoughtful, productive, skilled feedback that avoids bad feelings and improves outcomes. What is a Critical Friends Group® (CFG®) community and how is it different than a PLC? A Critical Friends Group community is a particular variety of Professional Learning Community (PLC), and Critical Friends Group® is a registered trademark of the NSRF® organization. CFG® communities consist of 5-12 members who commit to improving their practice through collaborative learning and structured interactions (protocols), and meet at least once a month for about two hours. Many general PLCs focus on standards, with the goal of students performing well on standardized tests. Educators may come home from conferences and workshops excited about creating PLCs, but quickly realize they weren’t given all the tools to accomplish the goals they espouse. As it turns out, back in the 1990s before many people had heard of PLCs, the National School Reform Faculty created specific protocols and activities to promote best practices when it comes to teaching, as well as to improve student achievement. NSRF Critical Friends Group Coaches’ Training will teach you how to create an environment of trust, how to give and receive feedback most effectively, and how to use our protocols and activities to help students — and teachers — create a culture of excellence. Most of all, CFG communities deeply support you and your colleagues working together to improve everyone’s work and that of your students.